L-ION series products are universal configurable controllers that can be used to manage a variety of building systems including heating, ventilation, air-conditioning (HVAC) systems. Advanced control strategies are available for optimized performance. All functions are configurable via series of parameters. A comprehensive set of templates assure easy start-up. Analog inputs are optimized for PT1000 type temperature sensors and 0-10 VDC devices. 13 bit A/D converters assure high resolution measurements. All inputs are software configurable. Digital inputs allow freeze protection, emergency stop and fire scenarios to be implemented. Additional information such as filter clogging may also be communicated to the BMS via the Modbus protocol. On the -EP models, one dedicated input allows a remote potentiometer (1-11 kOhm) to be used for remote set-point adjustment. L-ION's may be configured to control a wide range of systems. The configurations are saved in non-volatile memory, thus pre-configuration is possible prior to shipment. Four control loops are provided to control four different process variables. For example, temperature and humidity can be controlled on an air handling unit, or four valves may be controlled on four heat-exchangers. In addition to basic proportional + integral (PI) control, upper and lower limits, compensation, cascade control can be configured for each loop. Sequential control of heating and cooling systems is possible. All the parameters are set using the buttons and display on the controller. Instead of setting all the parameters from scratch, templates are available for a wide range of common systems. Predefined settings may then be optimized for the applied system. -M models have time schedules that allow the system to be operated on desired periods. Weekly programming is possible. 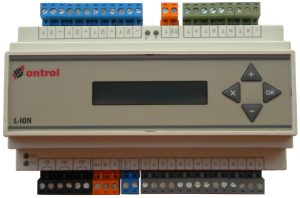 -M models also offer Modbus RTU protocol over RS485 is provided to communicate with Building Management Systems. This allows manufacturers of AHU's and similar equpment to ship BMS ready devices. Troubleshooting is facilitated by the logs of fault and alarm conditions, power failures and manual overrides.